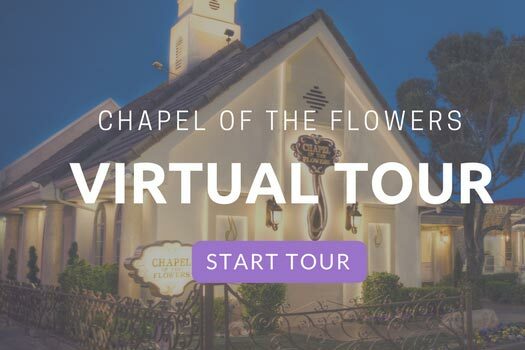 Take a tour of our legendary wedding chapel and see what makes Chapel of the Flowers the most elegant free-standing chapel located on the Las Vegas Strip. 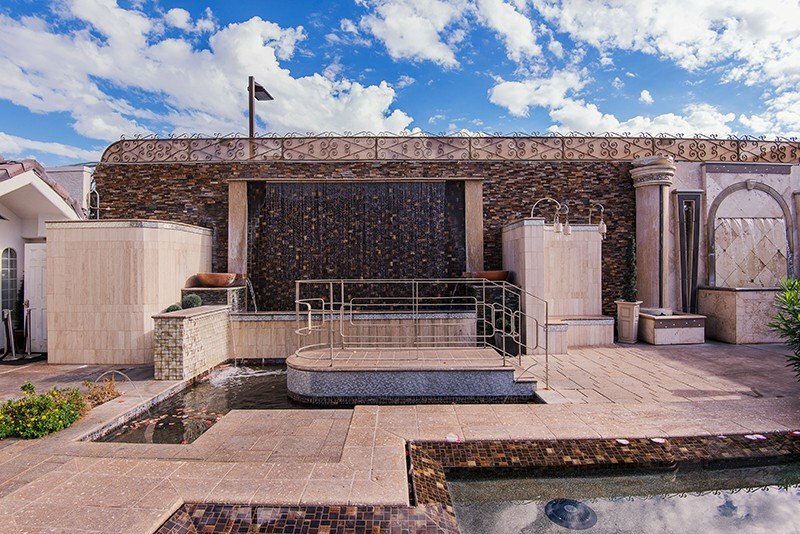 Our venue is a top-ranked Las Vegas attraction on TripAdvisor and couples love our luxurious wedding venues , on-site photo session locations and exquisite property. Whether you are looking for a romantic modern chapel or outdoor garden location, we have five on-site ceremony venues perfect for any wedding style! 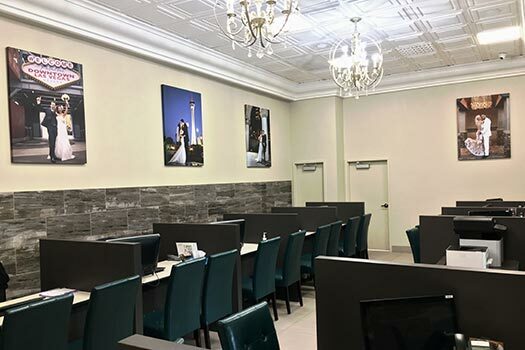 Experience the chapel online or in-person, then speak with our professional /contact-us">wedding planners who will be able to assist you with designing the Las Vegas wedding of your dreams! Capacity: Seats up to 30 guests. Additional Information: Private Lobby, Minister Meeting Room, Private Restroom, Equipped with 3 High Definition Video Cameras, Live Internet Broadcasting available. Sparkle amidst the shimmering elegance in the Magnolia Chapel. Our blush wedding chapel is decked out with an abundance of crystals from floor to ceiling. Soft pink-colored benches complement the custom marble mosaic floors, and opulent crystal chandeliers creating a serene stylish setting to profess your love. Capacity: Seats up to 20 guests. Additional Information: Private Lobby, Minister Meeting Room, Equipped with 3 High Definition Video Cameras, Live Internet Broadcasting available. 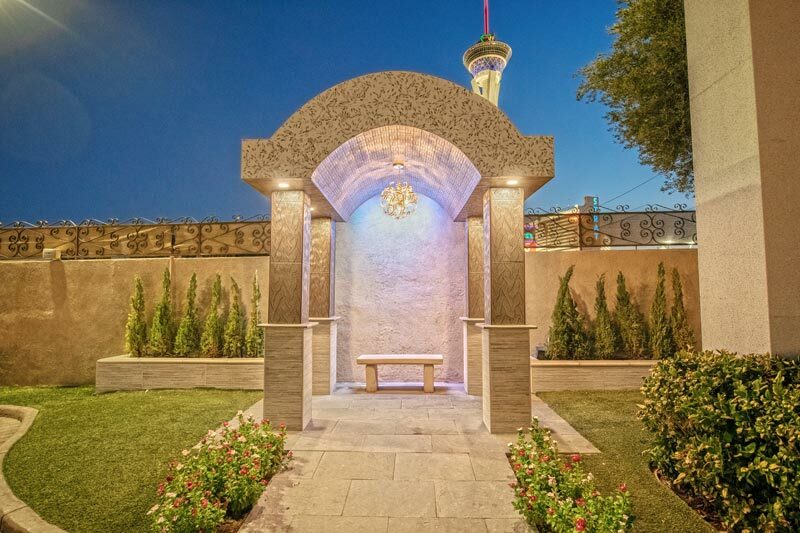 Inspired by 5-star Las Vegas resorts, the La Capella Chapel was designed to impress. The upscale style of the modern chapel starts in the lobby with high-end finishes, and continues into the chapel with textured wallpaper, stunning light fixtures, and coffered ceiling; giving you a luxurious setting. Capacity: Seats up to 80 guests. Additional Information: Private Lobby, Minister Meeting Room, Grand Exit, Equipped with 3 High Definition Video Cameras, Live Internet Broadcasting available. Make a statement in our rustic-chic garden chapel. Adorned with designer wood planked walls, stone water-wall altar, greenery accents, lush foliage, and glass ceiling with custom lighting to mimic the sky. Enjoy the climate controlled space, while creating unforgettable memories in our Glass Gardens. Capacity: Seats up to 88 guests. Surcharge: $300 chapel fee on Sunday- Friday, and $400 chapel fee on Saturday. Please note: Friday, Saturday, and Sunday weddings during peak season (March-October) will be subject to a higher chapel fee for Glass Gardens. Wishing for a fairy tale wedding, or enchanting garden ceremony? Dreams do come true in our intimate, storybook Gazebo. Nestled outdoors amongst mature landscaping, and lovely blooms; you and your guests will be delighted during your whimsical wedding at this picture-perfect location in Las Vegas. Capacity: Can accommodate up to 20 guests. Additional Information: Gazebo ceremonies will check in at the Victorian Chapel. Live Internet Broadcasting is not available - outdoor ceremonies are taped, uploaded, and broadcast online as soon as possible. This magical photo location is one of the most popular choices for onsite wedding photographs. The dramatic stone archway with its magnificent crystal raindrop chandelier is surrounded by glimmering glass tiles and stonework. After dark, the Stratosphere lights up the background for a truly Vegas wedding moment! Make a moment last forever with an awe-inspiring wedding photoshoot at our Reflection Falls. This contemporary backdrop offers custom LED lighting display, and stone-faced water wall paired with tranquil pools to create spectacular photo opportunities for couples desiring romantic wedding photos. Reminiscent of a grand ancient temple, Grecian stone columns flank this photo location for a bold statement with a custom marble tiled wall. 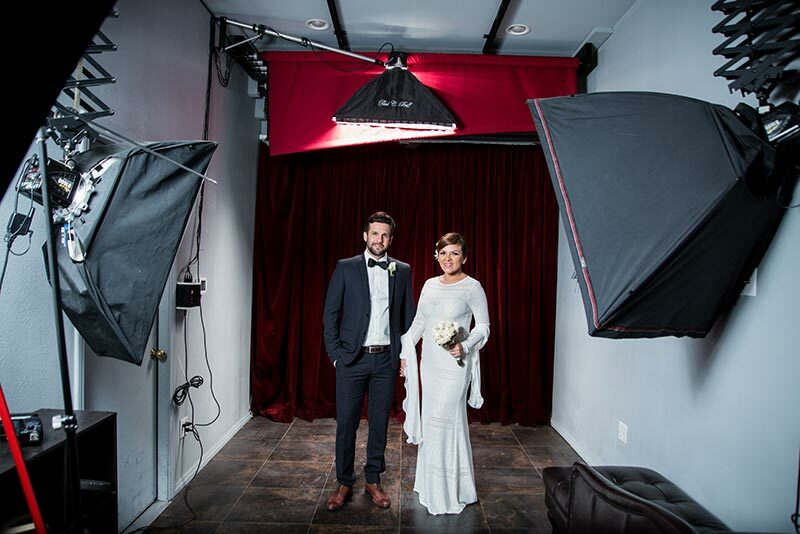 Whether you are eloping in Las Vegas or have the whole family attend your big day, this space provides the perfect stage for small and large group photos. Lights, camera, action! Let one of our professional wedding photographers help you set the stage for a personalized photo shoot that uniquely reflects your personality and style. You will feel like a model while using a variety of backdrops and props in our state-of-the-art photo studio. Our talented wedding planners can help you create your dream wedding. Chapel of the Flowers has been planning stress-free wedding experiences for nearly 60 years, and will help you arrange everything needed for your special day. Contact our planning experts today to start designing your Las Vegas wedding. View all your photos the day after you marry in our new and improved wedding photo gallery. 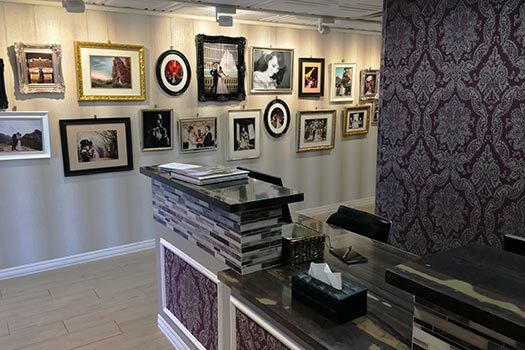 Relive the moments through a personalized slideshow, while our friendly staff helps you pick your favorite images to take home. They can also arrange digital copyrights, specialty & enlarged prints, and canvas orders. We are called Chapel of the Flowers for a reason. 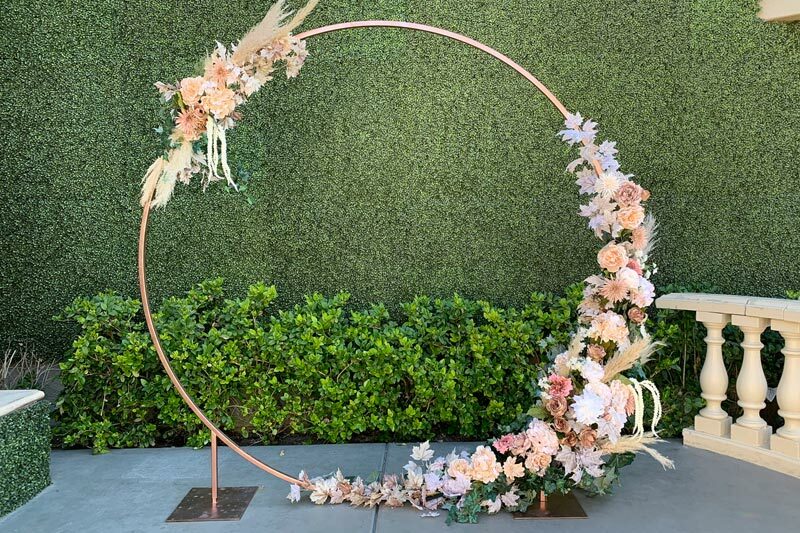 Our talented on-site florist can create everything from pre-designed floral arrangements to custom bridal bouquets , boutonnieres , and ceremony décor. 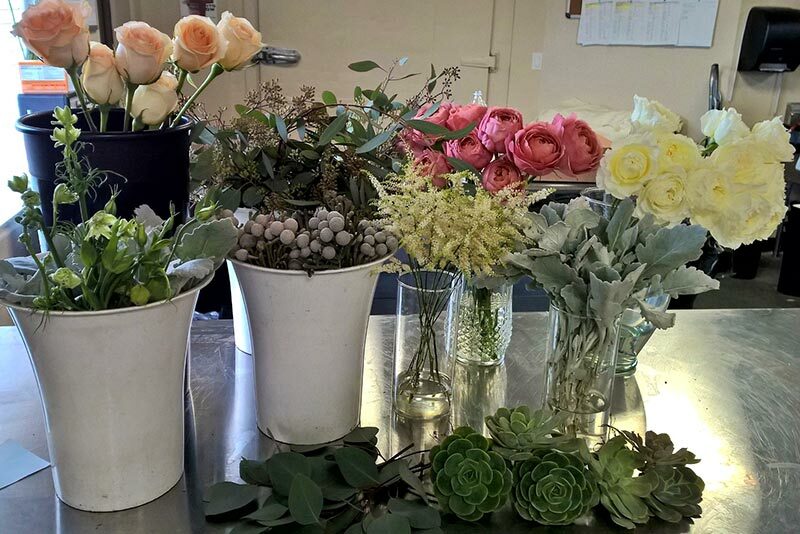 We will work with your wedding colors and scheme to design a beautiful floral display for your wedding day.